The Crossing Theatre, Narrabri was completed in 2003. The name was selected for the centre because of its location on the river - this location being the original crossing for settlers in the area. 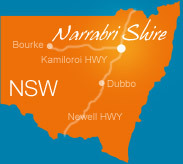 This complex is one of the largest of its kind in regional New South Wales and has provided countless benefits not only for the Shire but the North-West region. The Crossing Theatre features two cinemas. The first cinema contains 158 seats and the second cinema contains 79 seats. The cinemas have state-of-the-art audiovisual equipment and show the latest release movies. The Crossing Theatre features a large auditorium with a stage suitable for live performances with floor and gallery seating. The auditorium and gallery can seat up to 1,000 people. The large adjoining commercial kitchen and floor space can accommodate for up to 400 guests for a sit-down meal. Adjoining the Auditorium is the Riverside Room. This room features the bar and full length glass panels giving stunning views of the parklands and river. There is a balcony bordering the Riverside Room for outdoor entertaining. This room is suitable for smaller functions such as cocktail parties or as a foyer for functions in the auditorium. The Band Room is situated below the Riverside Room overlooking the river. The Band Room is perfectly set up for the Narrabri Shire band to practise and store their instruments. Directly outside the Band Room is an area, ideal for outdoor functions and Marquees. The Exhibition Room at the Centre currently holds the impressive Civic Art Collection. The Civic Art Collection is maintained by the Friends of The Crossing Theatre and the gallery is frequently open to the public. This room can also be used for smaller functions, exhibitions and seminars as well as travelling art exhibitions. To view details on upcoming events and movie times please visit The Crossing Theatre website. You can contact The Crossing Theatre on (02) 6792 4654.